that was held at Gumi city’s civil defense education center. 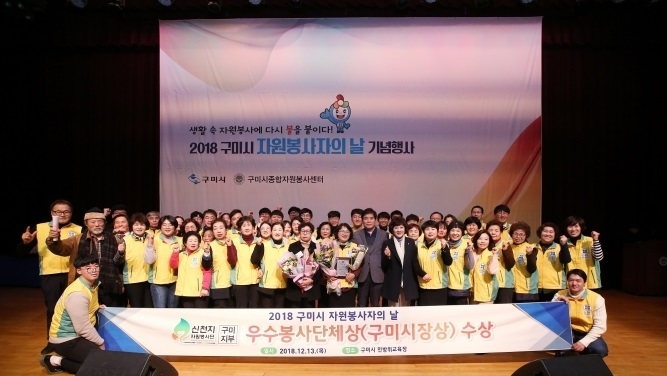 Last 16th of Dec., 2018, Shincheonji volunteer’s group Gumi branch (Shinchoenji volunteer group, Gumi branch leader: Kyung-un Woo) announced that the group is awarded ‘Excellent Volunteer Group Award from Mayor’ at ‘2018 Gumi city Volunteer’s Day Ceremony’ on last 13th at Gumi city’s civil defense education center. The event was hosted to boost morale and give pride to volunteers who devoted themselves for the neighbors in need this year, 500 regional volunteers participated the event. 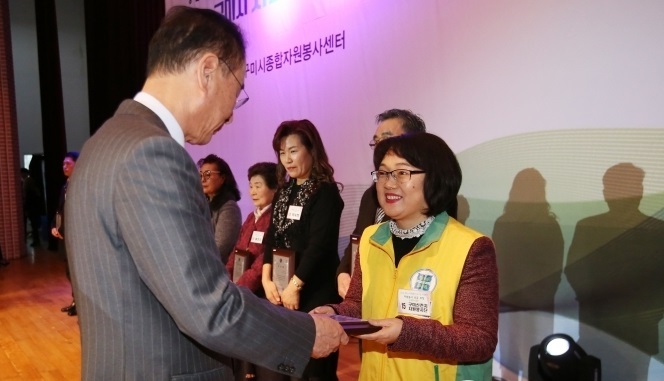 That day, 27 regional volunteer groups including Shincheonji volunteer group was awarded individual and group awards for their dedication to needy neighbors. Mr. Seyong Jang, mayor of Gumi city, said “Unsung virtue of 92 thousands local volunteers have vitalized local society” to compliment hard work of the awardees. Kyung-un Woo, Shincheonji volunteer group Gumi branch’s manager, said “Like the light, rain and air of the sky, we will keep devoting ourselves to make everyone in this area happy and smile with unsparing volunteering”. Gumi branch of the Shincheonji volunteer group has been acknowledged as an excellent public interest group in local community, starting with private and public joint social dedication activity in 2014, ‘2015 Excellence Award from Gumi’s mayor’, ‘2017 Excellent Volunteer Group Award from Gumi city’s volunteer center’ etc. This year, the group has planned and carried out 11 volunteer works which received appreciation plaques from the Association of Distinguished Military Services of the Republic of Korea and the Maroo Silvertown. Gumi branch of the Shincheonji volunteer group has carried out 1107 volunteer work last 5 years. It is 1143 days in period and 105.2 million 8790 hours in time. Gumi branch of the Shincheonji volunteer group, particularly, raised donations to help the marginalized area’s neighbors every year. This year, last 4th, the group visited ‘Hope 2019 Donation Campaign Love Temperature 100℃-Donation temperature 1000℃ event’ and donated 2,856,000 Korean won. This year Shincheonji volunteer groups in Korea, meanwhile, carried out ▲’Wall Painting Stories with hope’ that paints old walls in Korea into new colors ▲ ‘The Pink Cloth Delivering warmth’ that delivers foods for neighbors in need ▲ Running Shincheonji Multicultural Center for local foreign laborers ▲’Protect the green nature’ which is street cleaning campaign ▲’Beautiful senior, Bravo life!’ which is a culture program for the elders ▲’Love for all nations & Sharing of peace’ that succeeds that takes lead of volunteer culture of regional societies. Shincheonji volunteer group’s Gumi branch hosted the Filial Love Party for Parents’ Day on the 8th May.